The Body Politic: Bush's Last Day 20 January 2009. Bernie wanted me to post this - and for good reason. 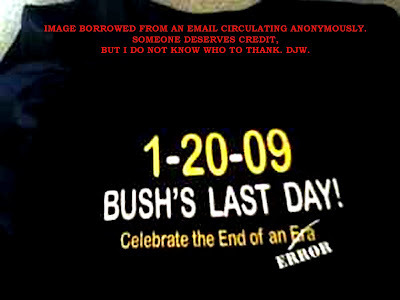 Certainly the G.W> Bush Presidency was indeed an era of error. Let me just say that this Blog wishes Obama all the very best for his Presidency. No doubt it will be difficult, with huge challenges ahead - the environment for starters. Do you remember Global Warming? And all that stuff about Kyoto Protocols? And that's not to mention the excesses of the Stock Market. My opinion on that will differ from what Obama is likely to do - he will continue to bail out the banks and stockbrokers, in order to keep the economy from collapsing totally. Personally, I think they need to charge the B"astards. In my view, theft is theft, and ought not be rewarded. There were other parts to the email, about the supposedly "funny" things GWB said, while President. I am afraid I do not find them funny, because, he was President (in all probablility, by fraudulent means), and he got to laugh at the rest of the world - for 8 long, miserable years. In truth, I doubt the world will recover from the excesses and errors of the GW Bush presidency within my lifetime. ASK THE MILLIONS OF AMERICANS WHOSE HOUSES HAVE BEEN SOLD FROM UNDER THEM BECAUSE OF THE "SUB-PRIME LOANS". AND THAT' S JUST FOR STARTERS. NONE OF THAT IS FUNNY! Let's hope President Obama can get on with repairing the damage done by his predecessor. Its moments like these when I feel like praying for him, and the world at large!